This coat rack is an example of an auction class project. 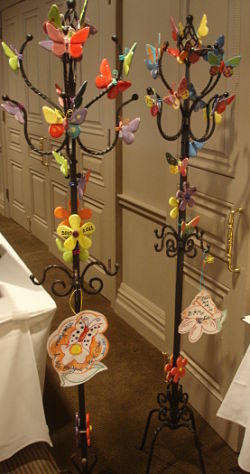 Students contributed butterflies and flowers to the rack, which was sold in a silent auction. Auction class projects, sometimes called art projects, are items that are handcrafted (at least to a degree) by children. Most often these children are students in a school. They’ve been tasked to create something to sell in the school auction. It’s not uncommon for these projects to sell for hundreds, or even thousands, of dollars. To see over 100 examples of auction class project ideas, available on DVD with bonus materials: Cool Class Projects. Why do these items sell for so much? Because when bidders are emotionally attached to something, they’ll pay more for it. School auctions are able to use a natural emotional tie to great advantage. A school will have a class or grade work together to create a single art project. The parents fall in love with their child’s work and bid against other parents to buy it. But what about nonprofit auctions? Could this auction class project concept work in that environment? Even though schools have been the traditional purveyors of class projects, some of my nonprofit clients have successfully incorporated them into their events. The projects might not sell as aggressively, but yes, they will sell. Here’s one key for this to work well: A component of your nonprofit’s services needs to focus on children. A performing arts nonprofit with a subsection of its services running a music program in public schools. I personally believe that one of the advantages of a nonprofit incorporating this type of an item into its auction is that it features one of the organization’s services. It’s mission-focused. You’ll need to decide on a project and (obviously) assemble the kids to create it. Once that’s done, your nonprofit will have to amp up the marketing. Whereby the parents at a school have likely been hearing about the class project (either from their child directly or because the parent has been asked to contribute to the project in some way), this isn’t the case at your nonprofit. Your guests don’t know about this project. So … how do you market it? One important element is to have a rich description. If you opt to sell the item in the live auction, the auctioneer will describe it. That will help enormously. If you sell it in the silent auction, highlight it with a meaty, but short, description. Imagine you’re 6 years old and just lost both parents in a car crash. That kind of tragedy can be devastating to an adult … so think of how it’s processed by a child. To help kids move through tough emotional times, our hospice offers ‘Grief Camp.’ Every year, 200 kids participate in our 5-week program to help them cope with death. It’s a model of success in our state. Pretty cool, eh? A fascinating decor item for your home … AND you’re helping our kids. See how you can weave your nonprofit’s mission into the auction class project’s description to help it sell? 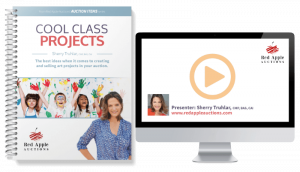 If you’re ready to get exceptional ideas for projects — 100+ items to sell, how to sell them, where to sell them, vendors that make them — read more about Cool Class Projects DVD and bonus materials.